New here? Wondering if this is the right place for you? You identify as a spiritual world-changer – or you want to. You followed the rules. You achieved “success.” Your friends tell you how much they envy your life, your career, your home. But you just brush it off, because you know that you still feel empty inside, like you took a wrong turn somewhere, like this isn’t the life you’re meant to be living. You feel disconnected from your family of origin, because none of your life choices are what they wanted for you. You dread the annual family get-togethers because you inevitably get cornered by family members who harass you with an endless barrage of criticisms about your life, couched as “helpful advice.” You’ve always been the black sheep. Sometimes you take pride in that, but sometimes it just feels lonely. It didn’t take you long to realize that your parents’ religion was not right for you. It took you a little longer to extract yourself from its grasping tendrils, but you eventually managed to escape. Since then, you’ve forged a slightly bitter peace with your religion of origin, but lately you’ve been wondering if maybe you’ve thrown the baby of spirituality out with the bathwater of religion. You find yourself drawn to Rumi, The Dalai Lama, Alan Watts, Eckhart Tolle. You’re skeptical of dipping a toe back into the water you almost drowned in, but your curiosity outweighs your fear. You used to love going to the movies, but you’re finding more and more that Hollywood seems to be ignoring your silent requests, and is instead producing more and more violent schlock and shallow, corny romcoms each year. You never really pegged yourself as an indie movie buff, but you’re having to look outside the mainstream just to find movies that don’t hurt you or offend you. You can’t even browse Netflix anymore because you feel like you have to take a bath after looking at the covers of some of the stuff that pops up. You see the world through the eyes of a child, filled with wonder and delight at everything around you. It often baffles you when other people walk through life with eyes glazed over. You’ve been labeled naive, overly idealistic, and “too sensitive.” The message you heard over and over and over was, “something’s wrong with me.” But recently you’ve started to wonder… what if something’s wrong with everyone else? It doesn’t matter whether you’re old or young, straight or queer, male or female (or neither or both). 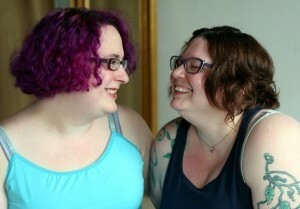 Fat or skinny, polyamorous or monogamous, transgender or cisgender, disabled or not, HSP or not. Race, nationality, hair color – it’s all good. It’s about who you are, not what you are. It doesn’t matter whether your wildness is on the outside or on the inside – if you want to live a wild crazy meaningful life, we want to help you get there. You have a creative spirit. You believe (or want to believe) that people are basically good. You’re spiritual but not religious. You’re a bit of a goofball. Click here to get the free Unmask Yourself workbook, packed full of our best tips, inspiration, and resources for expressing your authentic Self. …or you may be curious about us (Pace and Kyeli) and our story. Click here and we will tell all!